Please note that excess freight may apply for this item - if it does we will let you know and give you the option to change or cancel your order if you prefer. We always try to keep freight as economical as possible. 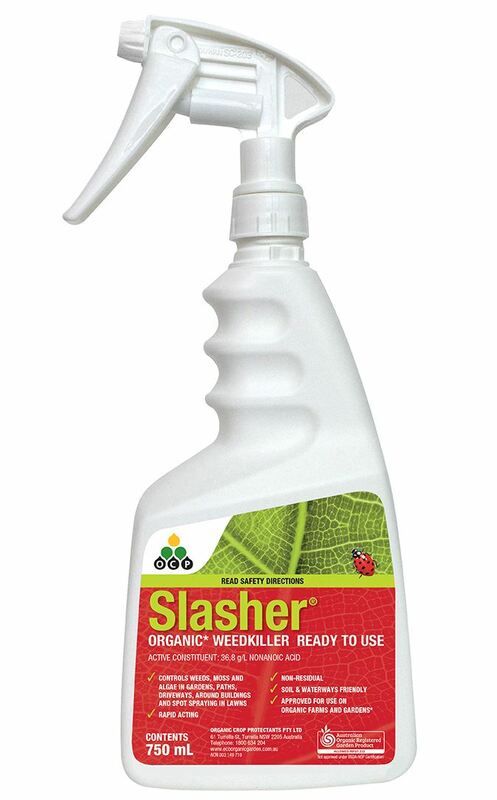 After many years of Research and Development and Regulatory hurdles, SLASHER WEEDKILLER is now on the market. 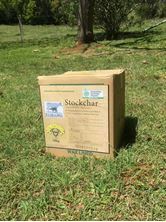 We have been using Slasher on our own organic property for several months and we are extremely impressed and satisfied with the results. We have used this product successfully to control GRT (Giants Rats Tail Grass). 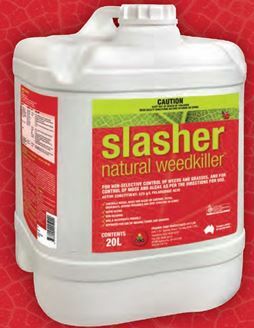 SLASHER Weedkiller is a non-selective fast acting herbicide. SLASHER WEEDKILLER contains 525g/L Nonanoic acid, also called Pelargonic acid which occurs naturally in plants including geraniums / pelargonium, apples, cheese, milk, rice, beans, oranges, potatoes and grapes. Nonanoic acid is also used in the food processing industry to assist in the peeling of fruits and vegetables. Includes orange oil. Pelargonic acid is a fatty acid which occurs naturally as esters in the oil of pelargonium plants. It can be made synthetically, however, to meet Organic Standards the Pelargonic acid in SLASHER is produced sustainably from biologically based raw materials using an environmentally sustainable patented method of extraction. SLASHER WEEDKILLER is the first Pelargonic acid based “burn-down” herbicide developed and made in Australia. Independent trials have validated that SLASHER WEEDKILLER is considerably more cost effective than other standard Organic weedkillers. 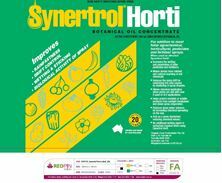 In particular it can be used where other herbicides pose significant risks in terms of public health and safety, drift onto sensitive plants and where soil residues can be taken up by larger trees. Bos Rural has been involved in an independant trial run by Landcare assessing the efficacy and impact of various non chemical (vs chemical) weed killers. The latest findings from this longitudinal study can be found here. Please note this is a very large file (3MB). results are usually visible as browning and wilting within hours of application. More advanced or established weeds may only be suppressed and require repeated application. spray drift will impact all green leaves so take care when applying around desirable plants. the USA Food and Drug Administration has cleared Pelargonic acid as a synthetic food flavouring agent, production aid and sanitiser to be used in contact with food and in washing or lye peeling of fruits and vegetables. SLASHER WEEDKILLER has not yet received USDA approval as a herbicide as the approval process is lengthy and expensive. 1, 5, 20, 200 L concentrates. Plus a ready to use 750ml spray. mixing rates will vary depending on sensitivity of weeds (ie perennial grasses will require heavier concentration than broadleaf annuals) but generally mix at 40 - 70 ml per 1 L of water (4 - 7L per 100L water). optimum application volumes are related to weed maturity and density. Ensure that all weed foliage is totally covered. Partial coverage will give only partial control. can be used on woody weeds but it is not as effective. Zero residues also means SLASHER will not cause any sub-lethal residual effects on surrounding plants and unlike some other herbicides will not upset the fertility of soils. SLASHER Weedkiller can be used safety around areas where children and pets play and where other animals might graze. This makes SLASHER a very versatile herbicide which can be used with a high degree of safety in just about all horticultural, agricultural and bushland environments. SLASHER Weedkiller will also control Moss, Algae, Lichen and Liverworts in paths, rockeries, tiled roofs, walls and driveways. This makes SLASHER very useful to Landscapers, Councils and other Parks and Garden officers who can safely use the product not only on weeds but across all surfaces where you might otherwise have to use a more corrosive or soil damaging heavy metal (Copper based) algaecide. Take care when spraying around your favourite plants as any spray drift will also damage them. Do not apply to wet weeds or if rain is imminent as the extra moisture will dilute the spray and weaken its impact. Available for purchase in 1L, 5L, 20L, 200L or 1000L plus a RTU 750ml spray.